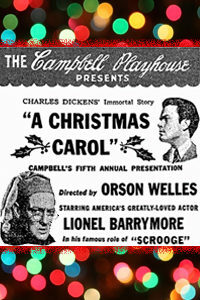 December 25, 2017 – This week, our time machine visits 1939, clicks on the radio, and listens to The Campbell Playhouse production of A Christmas Carol hosted by Orson Welles and staring Lionel Barrymore as Ebenezer Scrooge. When Charles Dickens published the story in 1843, he did so as what we’d call social commentary, reflecting the soul-searching of his fellow Britons about the true meaning of Christmas. Even 175 years later, we can see the importance of Dickens’ central themes in our own world, where so many TV shows have parodied the tale. Like the WPIX Yule Log here in New York City, Lionel Barrymore’s Christmas Eve performances grew into a tradition from the first in 1934 to his final appearance in 1953, a year before his death. Barrymore also features in a great television Christmas tradition, as the miserly Mr. Potter in Frank Capra’s It’s a Wonderful Life, written by a fellow Rutgers alumnus: Philip Van Doren Stern.